Special thanks to Jeff Mitchell for the following post! Election Day, the culmination of an 18-month (give or take) campaign season. Still, whether you scoff at the extended campaigning and 24/7 analysis as nothing but sound and fury; or whether you’re a political junkie, sleep deprived from too many late nights wrapped in the glow of cable TV or Twitter, consider that for many school-age students, this could be a time of discovery. When else are topics such as government, policy, education, the economy, and justice discussed as often as they are during an election year? When else does the conversation place such topics directly in the context of everyday lives, as it often attempts to in an election year? And even beyond the election, recent protests, from New York City to rural North Dakota, show there are many people reacting to circumstances in their lives and coming together to voice their concerns. So how does all of this impact student lives? What does it mean to be a citizen? What does it mean to be an activist? What are the current political and social concerns in the World? Can students, most of whom too young to vote, engage politically in other ways? For students interested in such questions, Lerner Digital’s new Who’sChanging the World series of eBooks examines some of our most pressing issues—individual rights, the environment, schools, health—and profiles motivated individuals who brought about change. 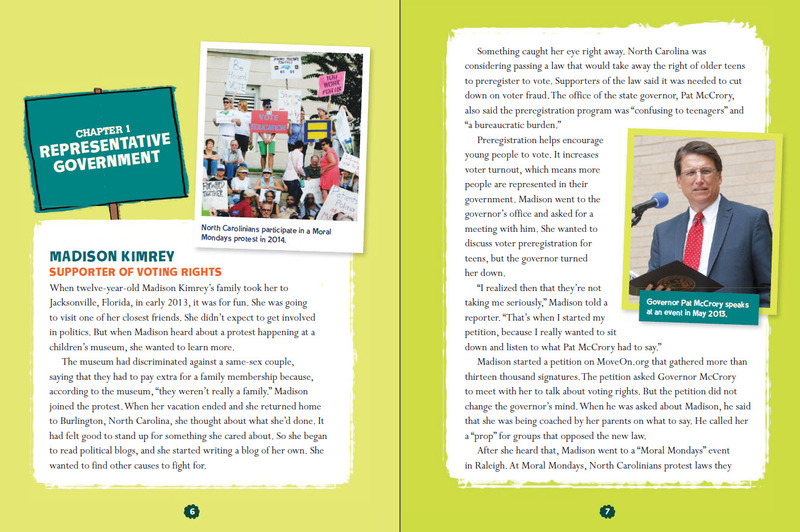 Written for students in Grades 4-6, these eBooks tell the stories of people who didn’t always start out as activists, per se, but who happened to observe something unfair or wrong while traveling on their various walks of life and took action to do something about it. Many stories even feature young students whom the powers that be maybe didn’t take as seriously as they should have! All profiles demonstrate examples of change brought about by motivated individuals choosing to observe, learn, and act. Taking Action for Civil and Political Rights, by Eric Braun. Do you ever worry about people being treated unfairly? Do you wish you could help make things better? The civil rights activists profiled in this book do that every day. One teenager organized a hunger strike and a protest of 120,000 people to demand voting rights. Three friends started the Black Lives Matter movement by commenting on social media. Another activist started a petition that asked teen magazines to stop altering photos of girls’ bodies. And a farmworker organized other farmworkers and consumers to ask for higher wages and better working conditions. Taking Action to Help the Environment, by Eric Braun. See how environmental activists take action in many ways: One eleven-year-old sold drawings of birds to raise money to help clean up an oil spill. A poet presented her writing against nuclear testing and rising sea levels to the United Nations. One activist coordinated murals and street theater to make people aware of health problems caused by local power plants. And a journalist wrote about the process of raising, processing, and selling beef, which changed how some meat is processed. Taking Action to Improve People’s Health, by Eric Braun. Have you ever wished you could stop the spread of diseases? Or help fight hunger? It can be as easy as taking a picture of your school lunch and posting it online. That’s what a nine-year-old in Scotland did to raise awareness about healthy eating and hunger. One young boy talked to his senator about health care. Another girl used animation skills to start a conversation about autism. These kids are all activists for health. They noticed a problem, and they did what they could to raise awareness and fix that problem. Read their stories about how they worked to improve health, and learn how you too can be an activist. Taking Action to Improve Schools, by Sabina Lawson. Do you ever think about the kids who don’t have school supplies? Do you wonder what you could do to make their school year better? The education activists in this book saw problems like this one, and they wanted to make a change. A seven-year-old in Canada made sure that kids in Ethiopia had pencils. A girl in Pakistan risked her life to make sure girls could go to school too. A second grader in Minnesota went to the governor to help end bullying in his state. Discover more about the education activists who are fighting to give kids a better education. 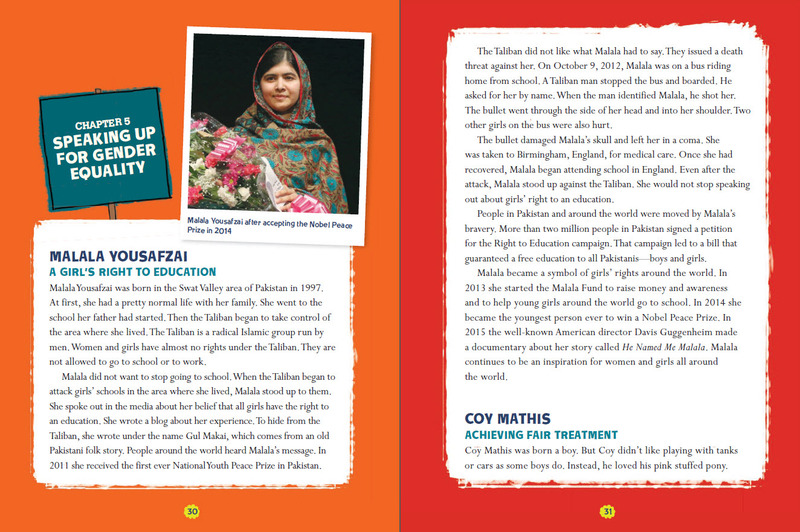 Explore the stories of these inspiring kids and adults, and learn how to start making a difference yourself!